One thing that is evident about our partners in the Use Your Head Campaign is everyone's total passion for both skiing and safety. We decided to find out a little more about them and why they have decided to back the campaign to wear ski helmets. Karyn is the founder of Tail Wags Helmet Covers, a company all about encouraging children and adults to wear their safety helmets by offering fun and funky helmet covers. 'I've skied since I was 3 years old, in other words, for the past 50 years! Although I can't do the mogul hills any longer, I still enjoy getting out with family and friends on the slopes. I've got behind this campaign because my ski helmet saved my life! Several years ago, I was skiing with my family and one of my sons called out "mom" behind me. I turned around to see what was going on but forgot to stop skiing and skied directly into a tree. I shattered my helmet but the outcome come have been far worse! The ski patrol who witnessed the accident said that without my helmet, I wouldn't be alive today. In Canada, helmet use is now mandatory for children and increasingly adults are getting into the habit of wearing a helmet too. This practice is saving lives. I have seen several extremely serious ski and snowboard accidents occur but fortunately only bones were broken ... bones can heal but brains are tougher to mend. 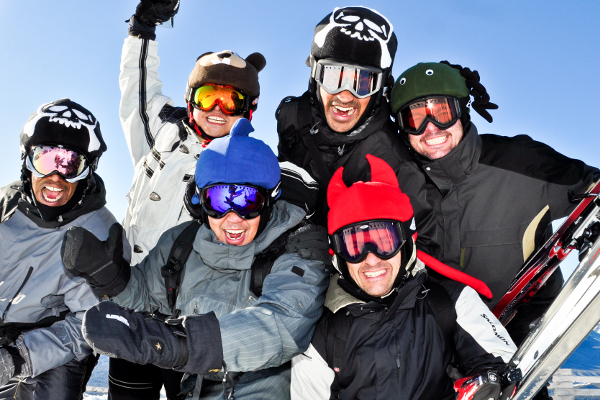 "Wearing helmets will help reduce the number of injuries and deaths"
Ski or snowboard in control! It's not just your safety at stake, it also impacts the other skiers on the slopes. If you haven't skied in a while, it's always good to take a refresher lesson ... this one hour lesson could mean the difference between an enjoyable day on the slopes or a trip to the hospital emergency department. Southern Ontario (Canada) is not known for its great skiing resorts but the skiing in Quebec and out West in Banff and BC is spectacular. I'm hoping to plan another BIG ski trip in the near future. Meanwhile, I'm content to ski Ontario with friends and family. As soon as the snow falls, I'll be headed up to Collingwood, Ontario where I have a standing invitation to stay with friends who own a chalet at the base of the mountain. Love it! Karyn's predictions for Ski Safety in the Future. It's only a matter of time before mandatory helmet use for ALL ages is standard policy world wide. This policy will help reduce the number of unnecessary injuries and deaths dramatically. 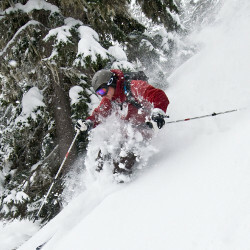 Mark Brigham is marketing director for leading ski and outdoor retailer Ellis Brigham. who has supported our campaign since the beginning. I both ski and snowboard but spend the majority of time on skis unless I'm going out with other snowboarders. I've worn a helmet for a long time and view any item that could potentially alter the outcome of an unfortunate situation for the better as something that you should seriously consider using. I actually was involved in an accident about 15 years ago which was my own miscalculation and I hit a tree ' I was lucky and suffered only mild concussion, but a helmet would definitely have helped me and since then I have always worn one. Ski or snowboard within your own ability ' always feel comfortable with where you are and what you are doing if you're not, don't! I did a ski season in Steamboat, Colorado so have a certain fondness for the area. But I also enjoy Andermatt and Morzine. As for where I will be this winter, I tend to wait for the season to get underway then usually decide when I have a better idea of work commitments. More people are looking to head off piste so I think ski safety (including ski safety awareness training and gear) will continue to be something that most skiers and snowboarders will take seriously and ensure they are adequately equipped for where they are going and what they will be doing. Rob Simon is the Managing Director of outdoor retailer Chelston Direct, who support our campaign for a second year. 'I have snowboarded a little, but prefer skiing as I have done it since a small child. I have been wearing a helmet for 3-4 years and once I made the change I have never looked back. Modern helmets are so light weight and comfortable you forget your wear one. Nowadays, you rarely see anyone skiing without a helmet. The 'Use Your Head campaign' is a great way of promoting the benefits of wearing a helmet. Try to make sure you are in control if you are skiing at speed and give beginners plenty of space. Skiing on the glacier at Saas Fee when it's quiet is beautiful. Also 'The Wall' in Portes du Soleil is a challenging but enjoyable run. My first trip this year is to Grindelwald, Switzerland. Rob's Predictions for Ski Safety in the Future? As technology improves helmets will inevitably get lighter and stronger. Also modern lift systems are getting safer and safer. 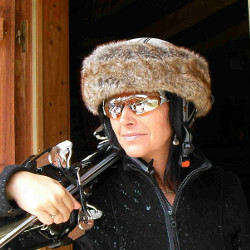 Barbara Lees is the founder of Fosy which sells scarves snoods, headbands, etc, all made from luxury faux fur, for use on the slopes and promotes the wearing of ski helmets. I have skied for 40 years, but only snowboarded for the past 6 years and it was for this reason I started wearing a ski helmet because whilst I was learning I was falling all the time. It was only then that I realised the benefits of wearing a helmet however I was unhappy about how it looked and so I set about improving the aesthetics and the fosy helmetband was born. We then started a business selling the helmetbands and promoting the wearing of helmets by women, targeting those who didn't wear helmets because of the way they looked. "We know there is still a large proportion of people out there that refuse to wear ski helmets. Anything that helps to change this is positive in our eyes"
We launched the helmetband in 2010 at the London ski show and persuaded many women to buy a helmet and of course a fosy! One of these women, Hilary Hands, contacted us a few months later having had an accident on the slopes she thanked us and said if she had not been wearing a helmet she would have mostly suffered a serious head injury. We support the campaign because we recognise the benefits of wearing a helmet, we know there is still a large proportion of people out there that refuse to wear ski helmets. Anything that helps to change this is positive in our eyes. Use your ears as well as your eyes, whilst we support the need to wear helmets we advise people to get one that does not impede their hearing, and to not wear headphones particularly on busy slopes. I shall be skiing early in December in Zell am See, Austria where I shall be making use of the excellent snow conditions before the crowds arrive at Christmas. I do think that whilst some countries will try and go down the route of making helmets compulsory on the slopes, the change will happen due to insurance companies such as yourselves implementing helmet only policies or giving substantial discounts to safety conscious skiers. 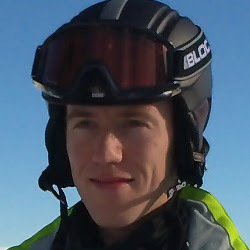 Paul Coyle is a director of ski hire and snowboard rental company, Rental Republic. I ski and snowboard, like an increasing number of 30 somethings I learnt to snowboard first and then progressed to skiing as my snowboarding plateaued, I got older and my children were starting to learn to ski. Now I rarely snowboard - there is so much more to learn with skiing! "Anyone who has ridden hard has likely banged their head hard. You only do it once without a helmet and realise that you only get one brain"
There was a time when helmet riding just wasn't perceived to be 'cool'. Thankfully the plethora of pro riders in glossy film productions now wearing helmets has helped shift the balance of cool in favour of protecting our skulls. Anyone who has ridden hard has likely banged their head hard. You only do it once without a helmet and realise that you only get one brain. We are involved in your campaign because we strongly believe that wearing a helmet should be given the same status as owning your own boots - essential for any rider. We want to encourage helmet wearing for everyone! ah... it won't happen to me.. I don't really go fast so I am going to be ok.. I think that it's a bit like driving in that it is often not yourself that you have to worry about, it is the others around you. Each season I can bank on placing my skis in a cross above a recreational skier that has wiped out without a helmet on and who is (hopefully) sitting up, very dazed and confused in a heap on the piste. Compact snow and ice is as hard as concrete to the back of your head, and, as for trees? Well the thought does not bear thinking about. Always ride in control and within the limits of your ability. Stop when you are tired. So many accidents are the result of tired muscles being unable to respond. The rider in front always takes priority. Be aware of other piste users when entering and exiting. Know the emergency rescue number! Ride sober!!! Three pints at lunch may make you feel like Jon Olsen, rarely does it actually improve your ability to make split second timing decisions! Hmm, thats a secret! However, if it has snowed then there is no better place that the local sector in Montchavin/Les Coches (darn - there goes one of my secrets!). it is the best area by far in the Tarentaise valley. Other faves of mine are Ste Foy and Val D Isere, all being well I will visit them all this year! "We are privileged to live in an age where safety and technology are combining all the time for our benefit"
Technology is moving quickly at the moment and we are privileged to live in an age where safety and technology are combining all the time for our benefit. The days of automatic GPS tracking via our smartphones is coming as are heads up displays on our goggles to tell us how fast we are travelling, in what direction and where we and our buddies are in case of an emergency. Once this is linked in to resort data-feeds we will see faster on piste response times and hopefully riders will be able to have greater awareness of the risks that they are taking. Buy a wintersports policy this ski season and you'll get discounts from all our campaign partners on a number of ski related items.